Spanierman Gallery opened on December 15, 2011, of Seeing Abstractly: Works on Paper and Small Oils by John Henry Twachtman (1853–1902). Including thirteen works from all phases in the artist’s career, this exhibition revealed Twachtman’s quick eye for the artistic possibilities in everyday life. Working in a direct and succinct manner, he brought a modern aesthetic to his art that was ahead of his time. He had an intuitive understanding of abstraction that other American artists did not acquire until after the Armory Show of 1913. The exhibition is a continuation of the gallery’s ongoing scholarship on Twachtman, which includes the preparation of a forthcoming catalogue raisonné on the artist by Ira Spanierman and Dr. Peters. New York Harbor Steam Lighter (1879). In their powerful contrasts of tone and form, these works signal the spirited confidence of the new generation of foreign-trained American artists of the late 1870s. Twachtman’s further travels in Europe in the early 1880s are represented by a few works. In Tuscan Scene (ca. 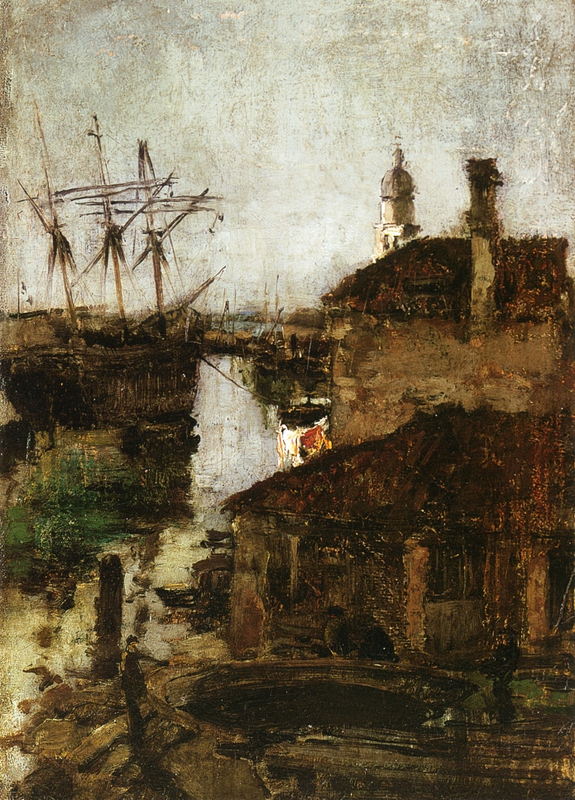 1880), he captured the serene and graceful beauty of a landscape that captivated him while teaching in Florence with his close friend, Frank Duveneck. 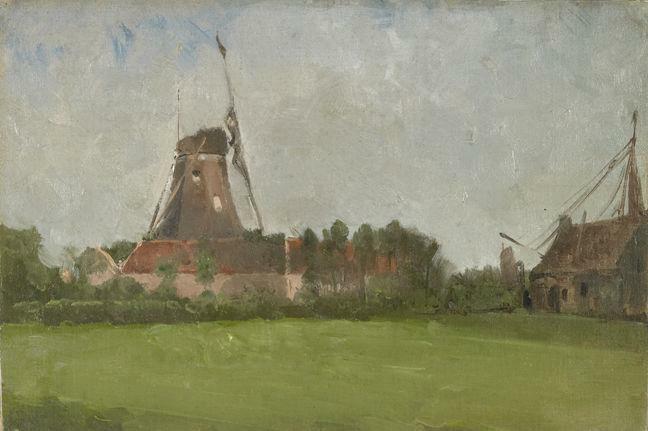 In two oils from his 1881 honeymoon in southern Holland, he expressed the innate artistic character of the countryside before him, in works characterized by compositional and atmospheric unity. The greater precision Twachtman achieved in his draftsmanship and spatial rendering during the years he studied in Paris, 1883-1885, is manifested in the pastels he began to create at this time. These consist of a scene of the French countryside, rendered with a light yet exacting touch, and a view of Holland, in which Twachtman expressed the tranquility of his subject in an iconic image. Twachtman’s European pastels are rare, and this work, related to his important oil, Windmills (1885, private collection), is one of his largest and more accomplished. Twachtman’s continued to explore pastel for its inherent qualities. His evolving approach is demonstrated in a view of Newport, Rhode Island, created in ca. 1889. Here he used line and shading to adjust the form of a sailboat to the flatness of the picture plane, evoking the art of Paul Cézanne, which would not be known in America until the early twentieth century. 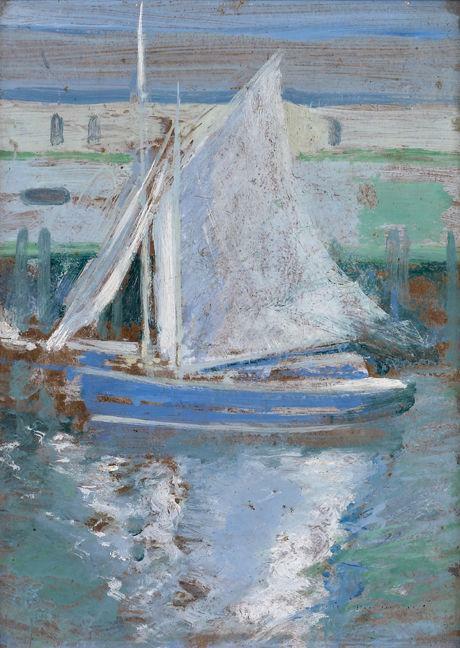 Two works from Twachtman’s Greenwich period in the 1890s reveal his adaptation of an Impressionist approach to pastel. In an image of wildflowers in nature, he blended pastel tones with that of his toned paper support, expressively conveying the combined fragility and strength of his subject. In a depiction of a bush by a road, he treated forms in sketchy, minimalist terms, capturing the spirit of his motif rather than its specific properties. Gloucester Sailboat (ca. 1900) is one of the dynamic and vibrant oils Twachtman created in Gloucester, Massachusetts, at the end of his life, in which he returned to the painterly approach of his Munich years, yet painted with the self-assured control he had developed over the course of his career. A member of many important organizations of his time, including the Society of American Artists, the Tile Club, the Player’s Club, and the Ten American Painters, Twachtman held to his own vision throughout his career. In 1899, he instructed his students to see with their own eyes in order to be themselves and thereby to save their self-respect. He stated: “it is necessary for artists to have an original way of seeing an original subject.” He followed this advice in his art, creating original and fresh images throughout his career. While his works capture the spirit of his time, his vision was that of an abstract painter of an era beyond his own.